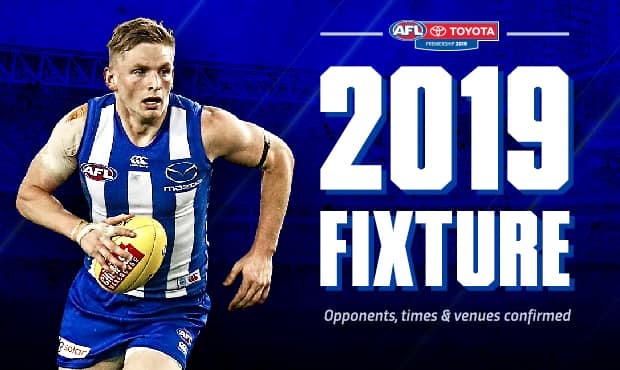 North Melbourne has received a supercharged draw in 2019 with massive head-to-head home matches in Victoria against finals contenders. The Kangaroos will play Richmond, Geelong, Essendon and Hawthorn at Marvel Stadium with each game promising large crowds and huge expectations. Following its mouth-watering match-up with Essendon in Round 5 on Good Friday, North will host a highly anticipated Friday night clash against the Tigers in Round 11. It marks a significant return to Friday nights for the Kangaroos - a timeslot they pioneered – with four overall Friday games. North’s other Friday encounters will see Jared Polec and Jasper Pittard come face-to-face with their old teammates at Port Adelaide in Round 6 at Adelaide Oval, plus a Round 20 clash with Hawthorn at Marvel Stadium. North managing director and CEO Carl Dilena said the draw was much stronger than last season and presented great value for members. “You can already see there’ll be a real level of hype and anticipation heading into many of our home games at Marvel Stadium,” Dilena said. At its home away from home in Hobart, North will face the Swans on a Saturday night in Round 9, as well as the Giants in Round 13, Saints in Round 16 and the Demons in Round 23. “Our Tasmanian fans will be getting some incredible games and in particular, the Saturday night match on free-to-air against the Swans will be huge, under lights,” Dilena added. “Night games at Blundstone provide a unique and electric atmosphere and that game will be a real highlight for us. Of last year’s finalists, North only plays Hawthorn and Geelong twice. Commercially, the Kangaroos have struck a far better deal than last season with five additional games on free-to-air television (eleven total) with Channel 7 and four Friday fixtures – up from just one last year. “Not only should our fans be happy with the draw, but also our sponsors and major partners,” Dilena said. But every draw has its challenges and North will have two trips to Perth and a difficult back-to-back travel sequence between Rounds 18 and 19. “We play Brisbane at the GABBA, and the Eagles the next week at Optus Stadium,” Dilena explained. Share in the Shinboner Spirit in 2019. Membership packages are now available here. Sync the fixture to your calender by clicking here.